After successfully escaping the bug infested shoreline of Brantley Lake we headed north in search of more (hopefully bug-free) lakes. And we found them! 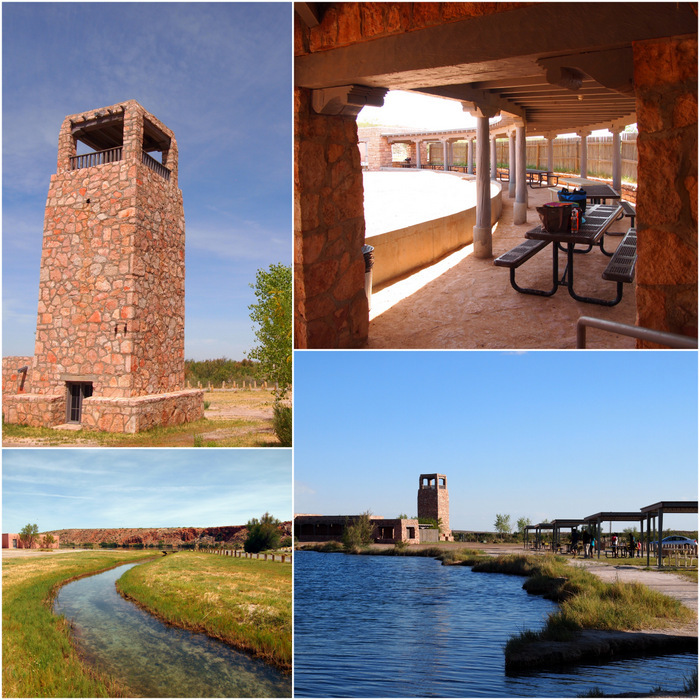 Bottomless Lakes State Park is a veritable oasis amid acres and acres of nothing but flat ranch land and oil fields. Amidst this rather desolate landscape lies a series of sink holes that prompted some enterprising soul way back in 1933 to say, “Let’s put a state park here.” Good idea. Except this person obviously wasn’t thinking straight when they named the park. For one, these lakes may be deep, but they are clearly not bottomless, and for two, I can’t even type the name without giggling. That’s cause I’m a child and find the word “bottom” funny…and the thought of being “bottomless” even funnier. But once we get all that confusion and immaturity out the way, we are left with nine gorgeous lakes. Mirror Lake is 50 feet deep and one side has fish, while the other has a salinity level too high for fish. Strange right? 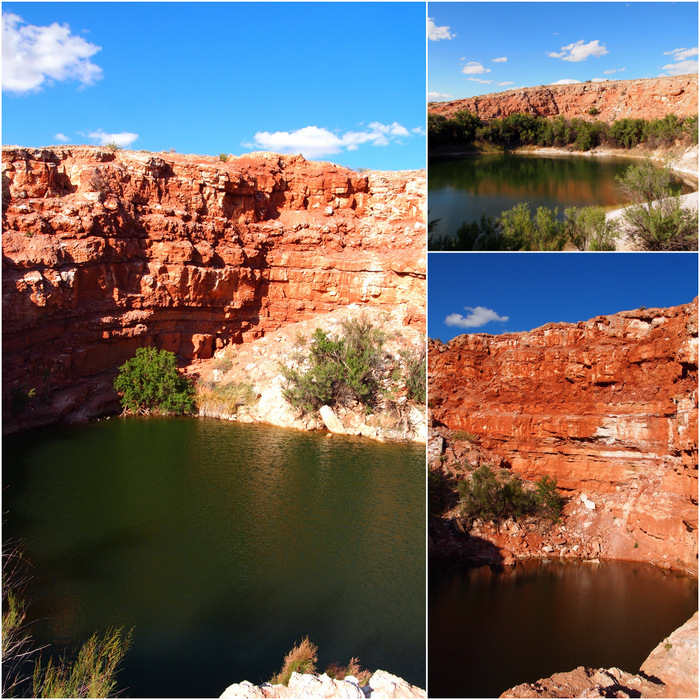 The lakes, or sinkholes, were formed when circulating water dissolved the gypsum and salt deposits in the limestone rock, creating a network of underground caverns. Over time the roofs of some of these caverns collapsed leaving behind deep, round holes which then filled with water. 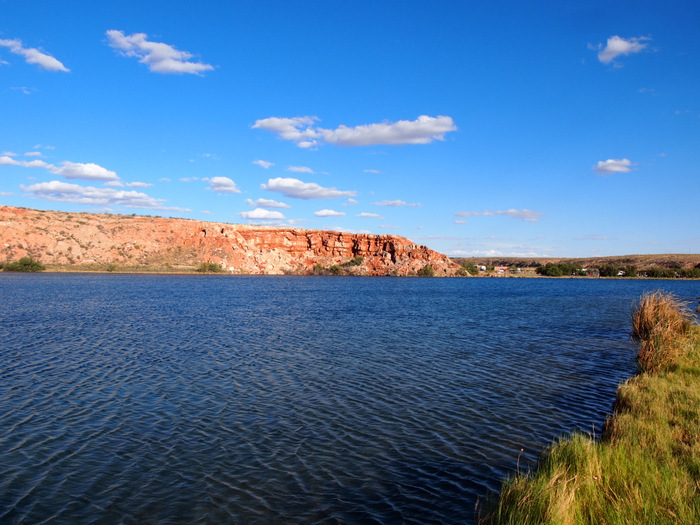 The name Bottomless Lakes (giggle) was actually established long before the state park. 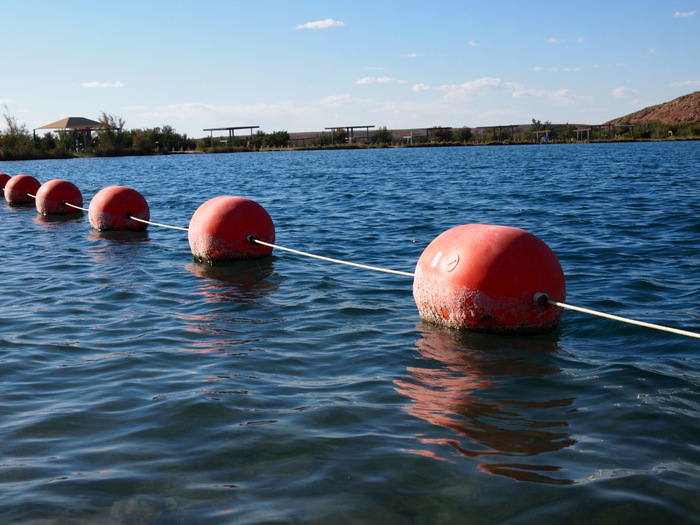 Legend says that in the late 1800s local cowboys tied ropes together, dropped them in the lake, and when the ropes didn’t reach the bottom concluded that they were bottomless. Brilliant. At some point a modern day cowboy must have come along with a longer rope becuase we now know that the lakes range in depth from 18 to 90 feet. All but the southernmost lake, Dimmit Lake which is owned by the local Fin & Feather Club (best name ever), are part of the state park. 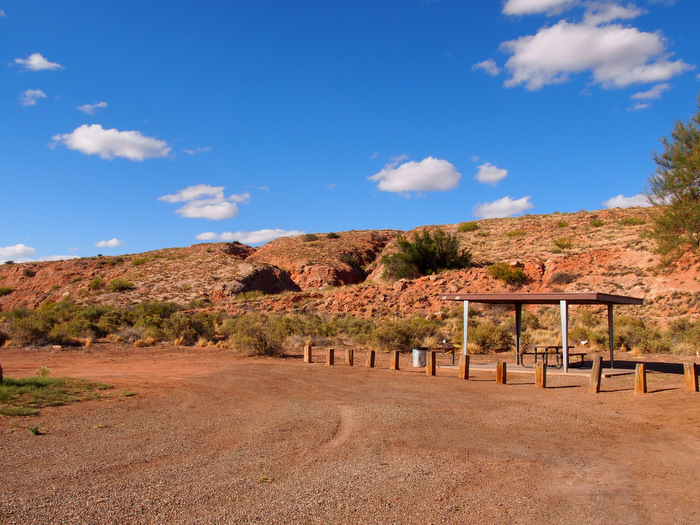 The lakes are situated in a chain formation, and the park offers up ten or so dry camping sites ($10/night) near the smaller lakes in the middle of the chain. The main campground is located alongside Lea Lake. 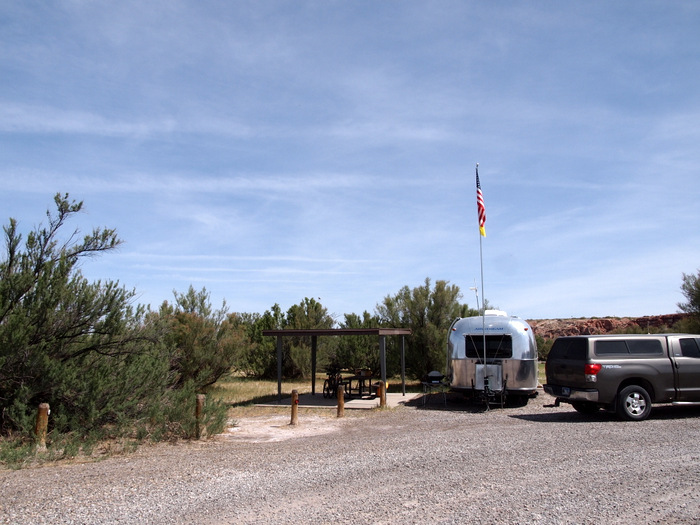 It’s a fairly typical New Mexico state park with large sites, nice picnic tables and shelters, and a mix of reservation and first-come-first-serve options. If you want a water view you either need to reserve one of the long pull-thru sites that face the water, or take one of the four no hook-ups sites. We decided against one of these because they look more suited for tents than RVs. Instead we found ourselves a really nice private spot in the far corner of the main loop. Our site has electric and water for which we are paying a mere $4/night with our pass ($14 without). By the way, for those who need or want it, the park also offers a few 50 amp electric and full hook-ups sites for only $18/night. We get plenty of sun exposure for our solar panels here, but since it was in the mid-90s on the day we arrived, we eagerly plugged in and sucked up a few blissful hours of sweet, sweet AC. Normally we’re not fans of AC, but after the crazy night of swatting bugs in our sweltering house, followed by hours of howling winds at Brantely Lakes, I think we needed a little break from the o’ natural approach. Since then the weather’s been perfect with no need for any more cooling than our two Maxx Air fans provide, although temps are rising rapidly today and supposed to get up to 90, so who knows, we may have to resort to the AC again. Or…we could just go jump in the lake! 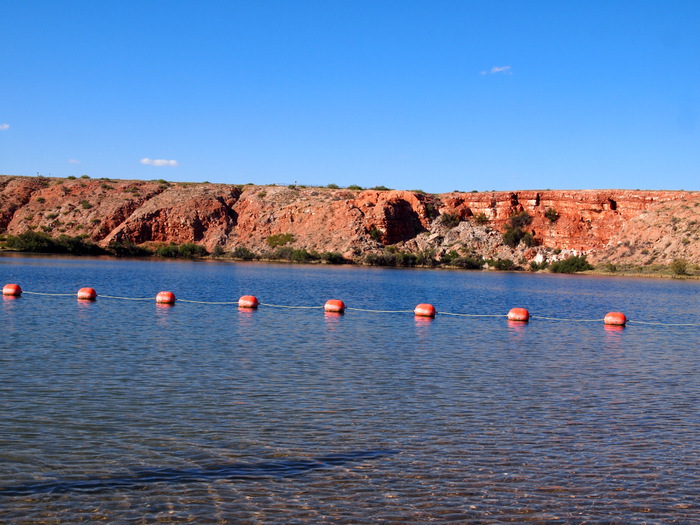 Lea Lake’s wide sandy beach and clean, clear water make it an inviting place to take a dip. Tim took his first swim on Wednesday, while I just waded in up to my knees wishing I had put my suit on. Yesterday I smartened up and joined him for a swim. It was refreshingly – or maybe shockingly is a better word – cold. I really wanted to go in though because for one it was hot, and for two, I’m pretty fussy about where I swim (has to be clear, clean, not stagnet, and with no mucky bottom), and since this lake fit all my requirements it was too good to pass up. During his first swim Tim discovered that the water in this land locked lake is actually salty! I looked it up and this is what they call brackish water, meaning that it’s more salty than fresh water, but not as salty as seawater. Apparently the reason for the saltiness is due to with the high evaporation rate of the lakes. The beach is a popular day use area for many locals. It offers up some really nice facilitates including a stone building that houses a semi-circle of covered picnic tables and a mysterious tall tower. The day use area was pretty packed when we arrived on Sunday, but has been quiet throughout the week. I’m sure it will be rocking and rolling this weekend with temperatures predicted to get into the triple digits on Sunday, which is one of the reasons why we’re leaving tomorrow morning. I can’t end this post without mentioning the nearby town of Roswell. You’ve probably heard of it? You know, the town where the aliens crashed? I don’t have a lot to say about the whole spaceship landing in Roswell thing. I’m not really one to get wrapped up in conspiracy theories, and I have better things to do with my time then speculate about government cover-ups and all that. 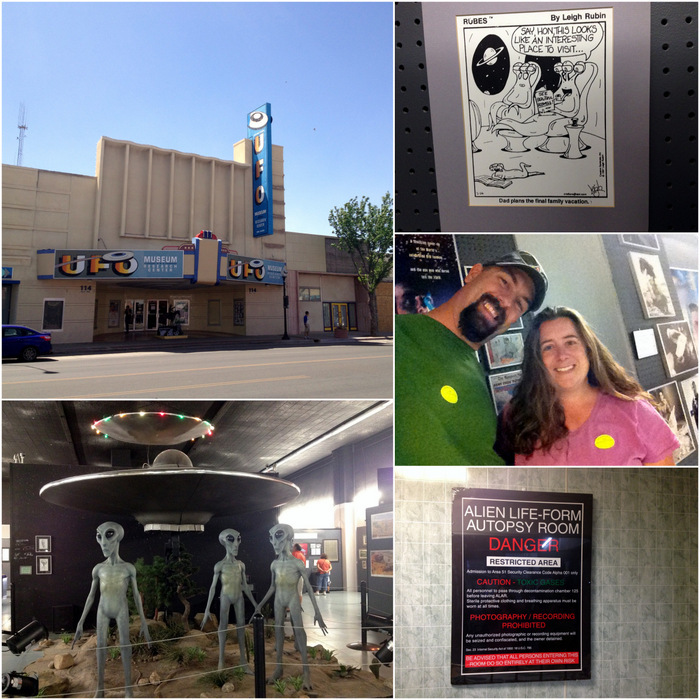 BUT- I do love a good museum, so on our way through town last Sunday we stopped to visit the UFO Museum. As far a museums go it was kind of meh. It’s the type of museum where there are no real exhibits, just partitions filled with articles and pictures. Which means you shuffle from one wall to another reading and absorbing. One side of the museum was all about the “incident” in Roswell. Which was interesting to a certain point before it started to get repetitive. The other side contained a huge compilation of articles, photographs, drawings and even cartoons. Again, somewhat interesting, but not something I would make a special trip to the middle of nowhere New Mexico to visit. 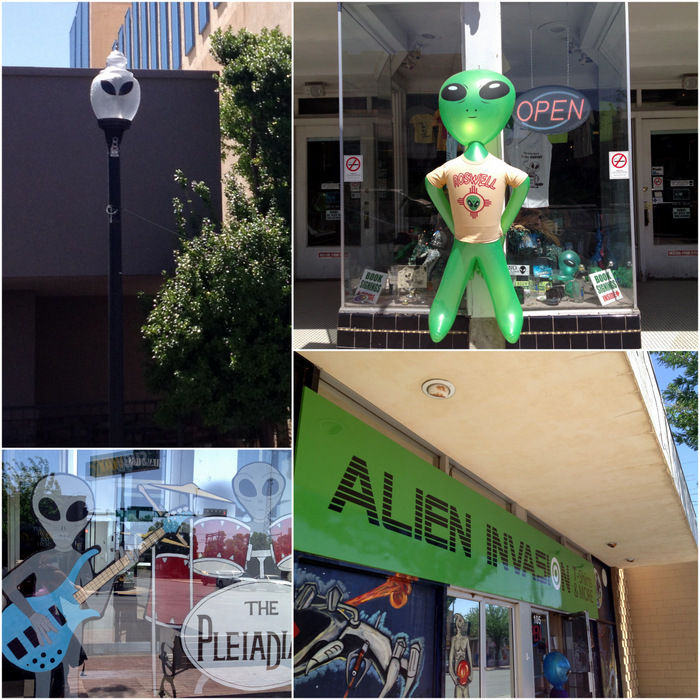 If you came to Roswell to visit the museum and then walked up and down Main St. you would probably get the idea that the town is alien obsessed. There are countless stores filled with alien themed trinkets. And even the more normal stores, like ones that sold musical instruments and furniture, had aliens window displays. However, I went into town a few days during the week and visited places like the library, laundromat and grocery store, and can confirm that there were no signs of aliens and it really is just a normal working class town. And with that we end our stay at Bottomless Lakes State Park. For the next four weeks we will be taking a break from state parks. We’re headed to Santa Fe, and then up to the Taos area where unfortunately the state parks are not friendly for those of us who rely on a cell signal. Instead, we’ll be hitting up some private parks and enjoying our time in the mountains. We do have two more state park visits planned though. After we leave Taos we’ll head west along the northern edge of the state and stop at Heron Lake SP and Navajo Lake SP, before shooting north into Durango for the first week of July. That’s far down the road though. For now we’re looking forward to spending next week in Santa Fe! Heron Lake SP, eh? I will be in that area for the week starting with Memorial day. Earlier than you, right? I decided against Heron Lake because I wanted a site with a water view and all the sites at Heron with the views seemed to small and don’t allow slide outs (not an issue for you, I know). 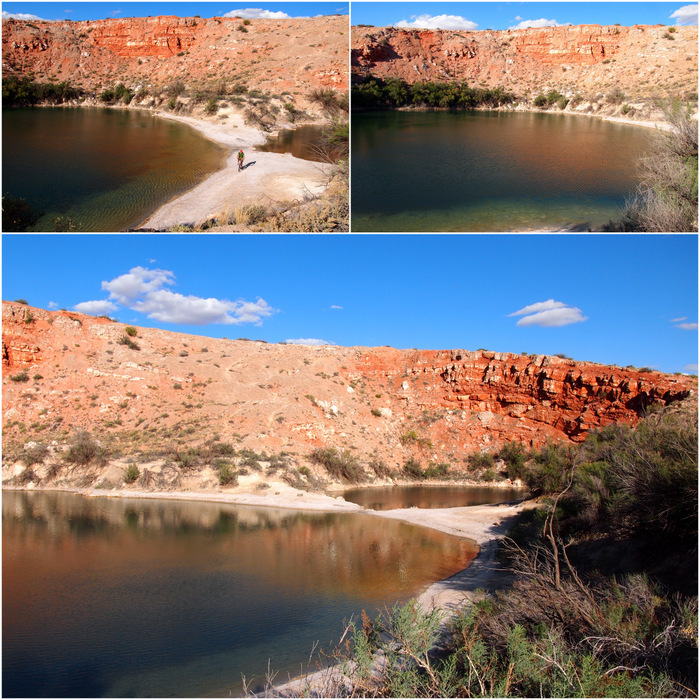 So I am staying at El Vado State Park – the next reservoir south. I will be hitting the Cumbres and Toltec Scenic Railroad in Chama – the real reason for me going to that area. Then back to the ABQ for my final 2 weeks. We won’t be at Heron until the week of June 15th. One of the reasons I picked it is because they have a huge amount of dispersed camping on the lake shore. I figure that way we can get a lake side spot without having to deal with the small sites in the campground. I look forward to reading about your stay at EL Vado, and the railroad sounds like a blast! Hey Amanda, we’re in Carrizozo at Valley of Fires and we can’t decide where to go next. 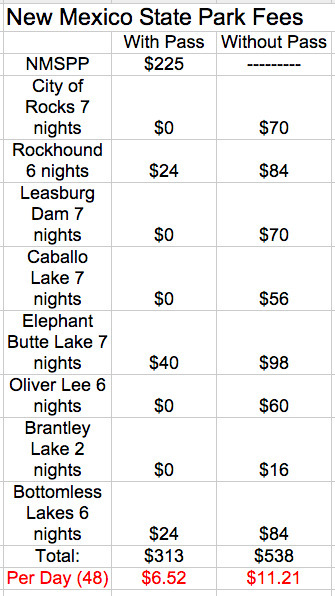 We were thinking about going to either Bottomless (hehheh) Lakes, Oliver Lee or Santa Rosa. Anyway… I was wondering if you could tell me how crowded Bottomless is now. We’re probably traveling Sunday, and with Memorial Day coming up, I was afraid that all the non-reserved sites might be taken. We’ve been there before and really liked it but it was early May and not crowded. I just reread your post and saw where you said it was almost empty so I guess that answers my question. Sorry I missed that before. As of right now (Saturday morning) there are still plenty of non-reservation sites available, BUT a huge group of high school students arrived yesterday afternoon and set up about 30 tents in the grassy space between the two RV loops. Not sure why they’re not in the group area? For such a large group they are pretty quiet, but just wanted to warn you that they are here :) Although, if you’re coming on Sunday there’s a good chance they might be gone by then. We’re actually headed to Valley of Fires tonight. We’re taking a round about route to Santa Fe to visit the Smokey Bear Museum, and then on to Valley of Fire to see the lava for one night. Sounds like you’ll still be there, so we’ll look for you to say hi! Thanks! We’re heading to Capitan and The Smokey Bear museum today, too. Sounds like we’re sure to run into you! We love Valley of Fires but we’re weird and it might not be everyone’s thing. We hiked the lava flow loop last night around sunset and thought it was really cool. We’ll look for you to say hi! I’m so enjoying this NM SP series. How far out do you plan your itinerary? For example, do you know what states you’ll be in for the rest of the year? We actually have a loose itinerary planned out for the rest of the year. Normally we only plan a month or two ahead, but we’re traveling along the gulf coast and into Florida next fall and I knew that to get into the SPs in the Florida panhandle we would need to reserve early. Have been enjoying your NM travels. I lived in Artesia and fished with my Grandmother at Brantley Lake (it was Lake McMillan back then). Great write up on Bottomless Lakes. Visited there a lot as a kid. Glad you are enjoying reading about our travels through NM, because we are really enjoying our time here! We noticed a lot of local folks visiting Bottomless Lakes on the weekends. I can imagine it’s a great place to go on a hot summer day! 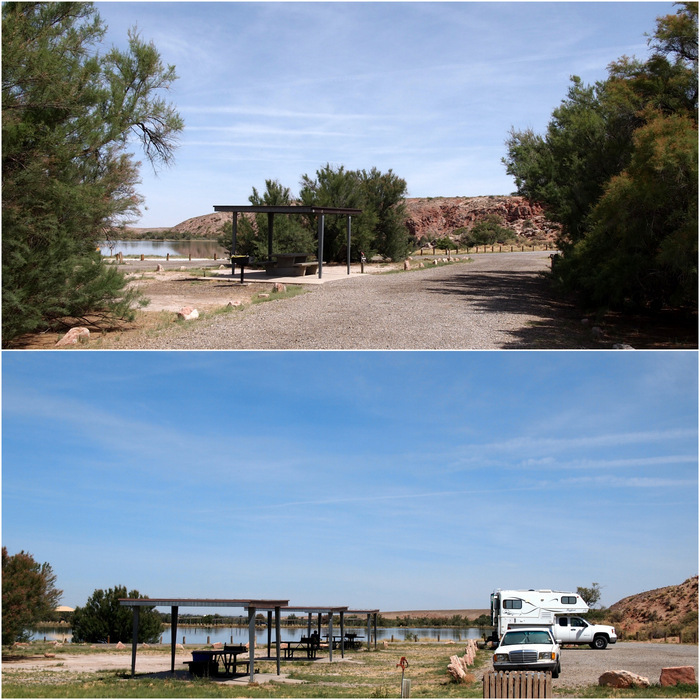 Thank you for the wonderful article about Bottomless Lakes State Park. We hope you stop by to see us many more times. The park was commissioned in 1933 and the land was donated to the state by the Fin and Feather Club. They however retained one of the lakes as a private lake, Dimmit Lake. The other 8 parks are part of the State Park. Thanks for adding this interesting info. I always like hearing how state parks became state parks. 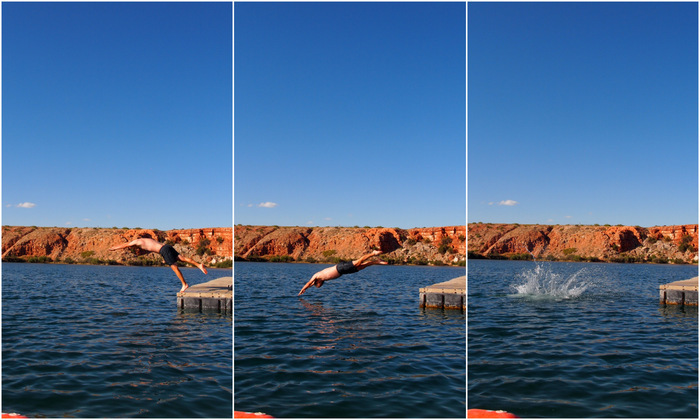 Since this post, we have returned for a second visit to Bottomless Lakes and enjoyed it just as much. 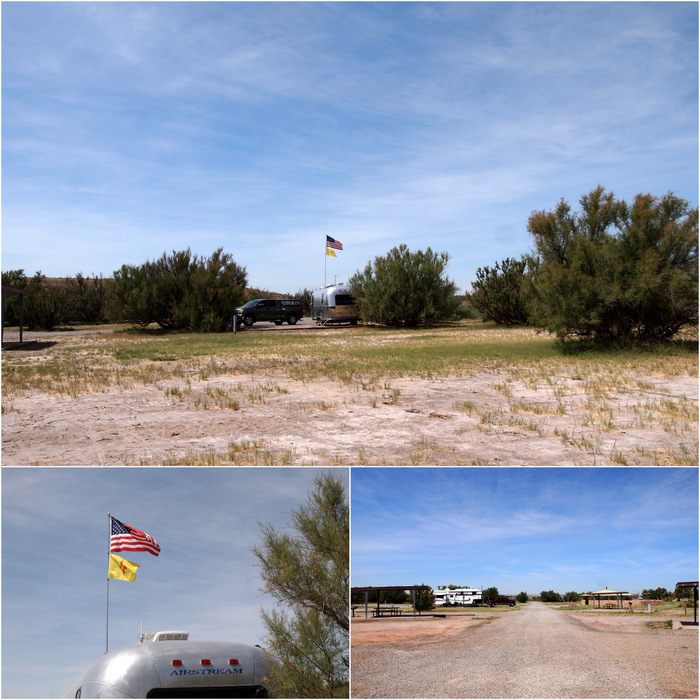 Hoping to make it back to NM in the near future and BL is high on our list of places to re-visit!